An infield fly off the bat of Hiroshima’s Te- tsuya Kokubo in the ninth inning falls between Yomiuri third baseman Shuichi Murata, right, and first baseman Juan Francisco, leading to bizarre ending to Monday’s game at Mazda Stadium. HIROSHIMA — In one of most bizarre endings to a Japan pro baseball game in years, the Hiroshima Carp scored a walkoff 3-2 victory over the Yomiuri Giants on Monday night on a pop fly that landed not two meters from home plate. 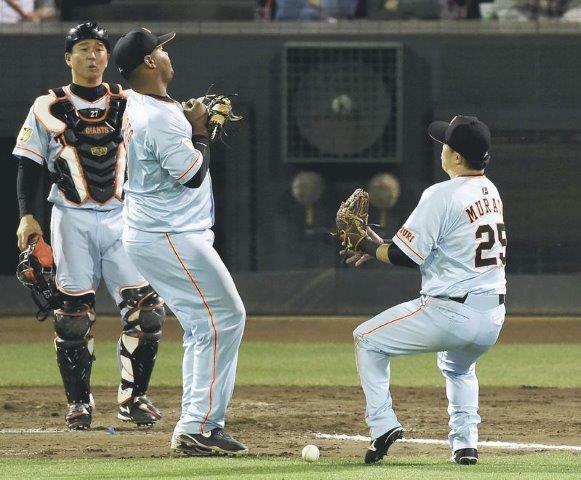 A series of mental mistakes — by Giants first baseman Juan Francisco and the home plate umpire, just to name two — allowed Takayoshi Noma to score the winning run from third base, and even he didn’t really know what happened. With the score tied 2-2 and the bases loaded and one out in the bottom of ninth at Mazda Stadium, Carp pinch hitter Tetsuya Kokubo popped up the second pitch from Scott Mathieson in front of the home plate. Both third baseman Shuichi Murata and Francisco rushed in to make the catch. But as the two looked at each other for an instant, the ball dropped between them. Murata would be charged with an error. At this time, the third base umpire correctly called the infield fly rule (See below), meaning Kokubo was automatically out. But Francisco picked up the ball and stepped on home plate, not realizing he had to tag Noma because the force at home was off. The home plate umpire also mistook the situation, and originally called Noma out. After Hiroshima coaches protested, the umpires huddled and announced that Noma’s run would count, ending the game. That brought out Giants skipper Tatsunori Hara, who was convinced by the umpire that the call was right. “I have nothing to say about it,” Hara said after the game. “It would be horrible if it happened to us,” Carp skipper Koichi Ogata said. Francisco said he meant to catch the ball, but did not comment on the ruling. Murata said he knew it was a tag play. Of bigger concern was that neither Murata and Francisco called off the other to make the catch. If one of them had caught the fly ball, the whole mess would have been avoided. Francisco recently joined the Giants because of his power at the plate. However, he may need time to coordinate with others in the field. The ending overshadowed strong outings by both starters. The Giants’ Kazuto Taguchi allowed two runs in 5⅔ innings, while counterpart Daichi Osera (1-3) picked up first win of the season. Mathieson (0-2) took the loss. The Giants tied the game at 2-2 in the seventh on Kazunari Sanematsu’s solo homer.